This code expires at the end of November 2018. 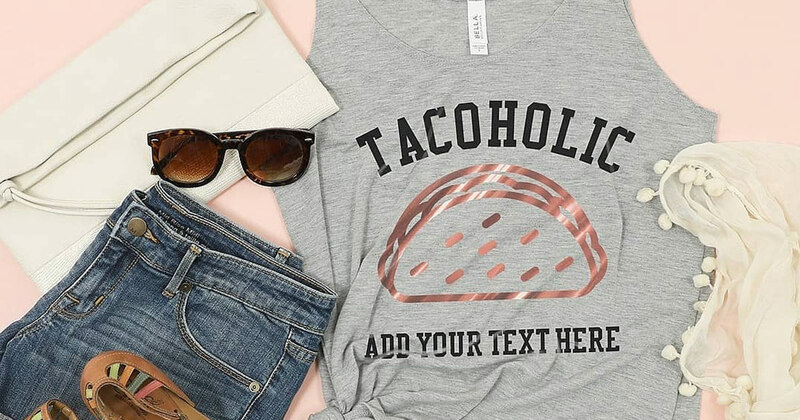 How should you spend $100 (well, $90 really) at Customized Girl? Lots of ways! This month, we are recommending our Christmas Sweaters. These aren’t just any sweaters. These are completely customizable Ugly Christmas Sweater Knitted-Style Graphic Designs. Add your own knitted-style text. Upload your own image. Make it unique and ugly as you want. We say “ugly” but of course we mean “beautiful”. It’s just that this beautiful aesthetic has become known as “ugly” or “tacky” christmas sweaters. 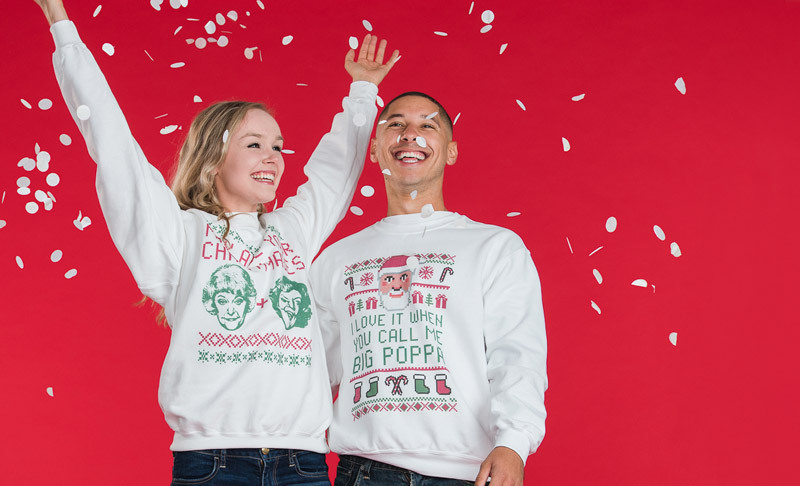 So if you’re excited about Hallmark Channel Christmas Movie Season, and if you’re ready to curl up in a comfy, custom sweatshirt, then you have found the right place. 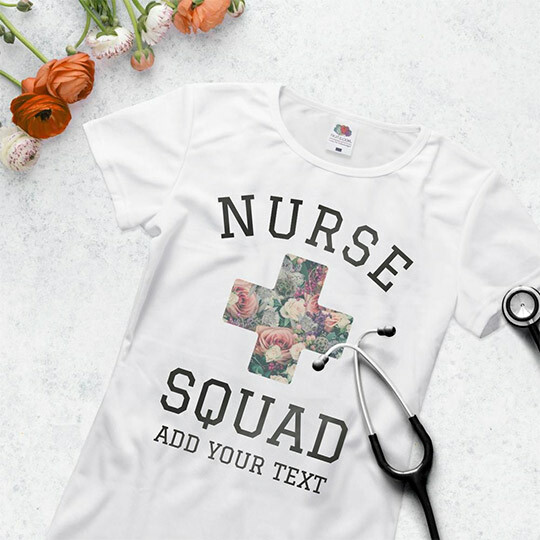 At Customized Girl, you can design your own custom shirts, tanks, and so much more. Some we print with ink. Some we print with a special vinyl film or foil. No minimums required. Certain items will allow you to add both ink and specialty foils! This is true for any of our Promo Tees, Raglan Tees, and Promo Sweatshirts. Choose one of those items and visit our design center. In the Add Text and Add Art tabs, you will see a color menu. Certain colors will have (+$3) or (+$6) next to the name. These are specialty foils! Choose one of these options, and you will see a pretty sweet rendering. For example, choose Gold Metallic. Move your text around, and you will see it glimmer and change as you move. Here’s the trick: these specialty foils are only available on the first tab within Add Text or Add Art. Why only the first tab? Well, it’s not ideal if multiple pieces of foil are layered on top of each other. It can get thick, and it’s not a great feeling on your soft t-shirt. One layer? Super thin and comfy. Two or three layers? Starting to get uncomfy. So we had to limit it to one type of text foil and one type of art foil. To do that, we limited it to the first text tab and first art tab. Why is this limited to certain items? 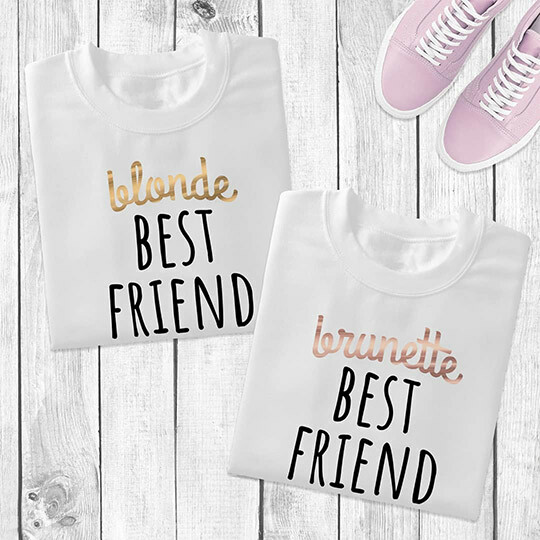 You might have noticed that our Basic Tees, Raglan Tees, and Promo Sweatshirts all have something in common: light colored bodies. It’s an easier process to get dark ink onto these light colors. Foils will overlap on top of this ink and it will work nicely. However, if we are printing light ink onto a black t-shirt, we use more processes, including pretreatments and a base layer of white ink. Foils do not want to stick when overlapping this ink. But again, the basic tees and some other items work great. Which means you can upload your own full color photo, get a beautiful print in ink, and then surround it with a fun foil, like metallic, glitter, opal, or neon! Think of it! Need a funny birthday tee for someone with a glittery personality? Upload a photo of their face, and add glitter text saying “Sarah Sparkles! Happy Birthday!”. We’ll print the photo in ink, and we’ll decorate the text using our glitter-sparkle foil. 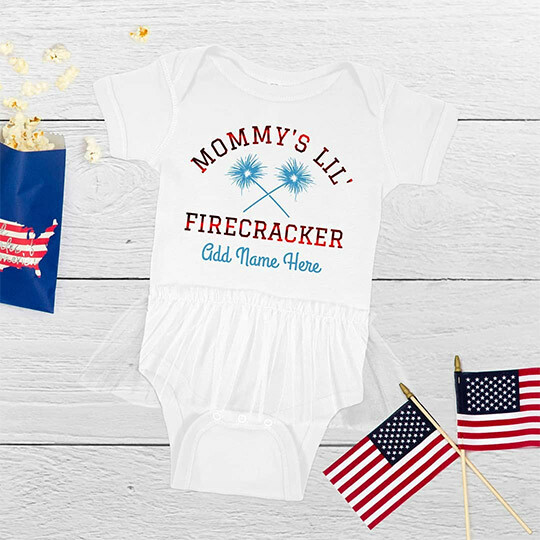 That’s why we love the onesie above that says “Mommy’s Little Firecracker”. Shouldn’t “firecracker” be written in a super-shiny Red Metallic Foil? We think so. 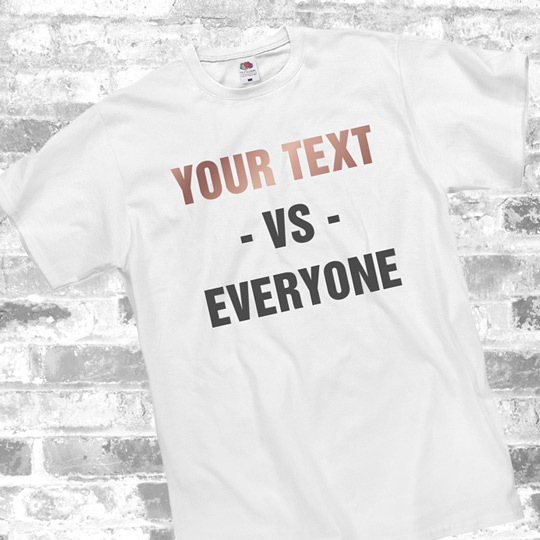 We’ve been selling these Your Text vs Everybody shirts for a while, but now you can take that design, put it on a promo tee, and really emphasize the most improtant part. Your part. The custom text. In this example, we’ve changed the custom text to an Opal Rose foil for only three more dollars. What specialty foils are available? Customize some of our ink and foil designs here.